Preheat the oven to 350F and butter a 9″ springform pan. Cover the bottom of the pan with parchment, and butter then parchment. Combine 1 2/3 cups chocolate chips with 3/4 cup butter in a saucepan. Melt, over low heat, until completely smooth. Whisk in the cocoa powder and vanilla, and let cool for at least 10 minutes. Bake for 42-45 minutes. The center will fall, and edges will remain lofty. Let the cake cool, in the pan, for an hour before using a spatula to press the edges down to the same height as the center. Invert the torte onto a plate, and remove the parchment. Let cool completely. To make the coulis, combine the wine, 4 Tbsp sugar, and the blackberries in a blender. Blend until smooth, then transfer to a saucepan and add the cloves, allspice, and bay leaves. Cook over medium heat until it comes to a simmer — then reduce heat to low, cover, and let simmer for 8 minutes. Strain into a bowl, discarding the solids, and mix in the bourbon and remaining sugar, if desired. For the glaze, combine the remaining 1 cup of chocolate chips with 1/4 cup butter in a saucepan. Melt over low heat until smooth, then remove from heat and whisk in 2 Tbsp of the blackberry coulis. Let the glaze cool 15 minutes before pouring and smoothing over the torte. Let the glaze set, about 1 hour, before serving. 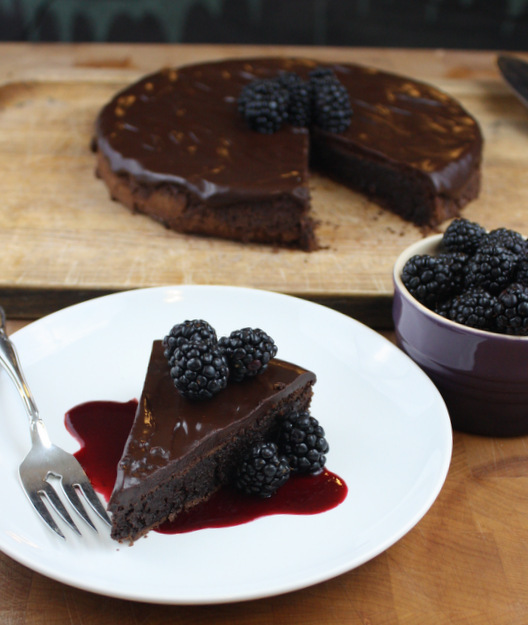 To serve, garnish each slice with extra blackberry coulis and fresh blackberries.